This is a history of motorcycling and a visual directory of major marques with detailed specifications, shown in over 1250 fantastic photographs. This is the ultimate book for all lovers and devotees of the motorcycle - its history, development and culture. It is a complete account of the motorcycle, including special features on sport and racing, touring, custom motorcycles, record breaking through the years, motorcycles at war, in the movies, at work, and much more. 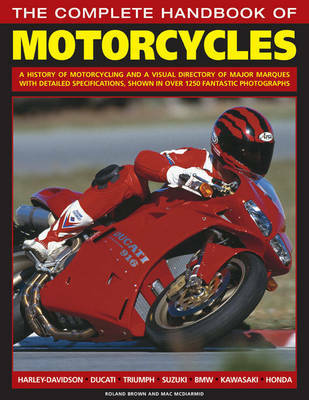 It is a comprehensive marque-by-marque guide with pictures of every motorcycle accompanied by detailed text. It includes a dedicated section celebrates the Harley-Davidson - looking at its history and evolution, with a directory illustrating every model ever produced. Hundreds of photographs, authoritative text and fascinating archive material reveal all there is to know, past and present, about the purest form of mechanical power. In this fully illustrated volume, the world of the motorcycle is covered from its iconic status down to mechanical nuts-and-bolts. The first of four sections, "The World of Motorcycling", charts the evolution of the motorcycle from 1885 to modern superbikes. The "A - Z of Motorcycles: is a marque-by-marque encyclopedia of models and manufacturers, both existing and defunct. The "World of Harley-Davidson" is a complete guide to this legendary machine. Harley-Davidson Models is a directory of every H-D model produced. This is an invaluable reference book for all enthusiasts, from novices and experienced riders to historians and collectors.